This homemade orange and espresso soap recipe was inspired by my own homemade coffee soap recipe as well as Beth’s recent soap recipe for making hot process pumpkin pie soap. Like my coffee soap recipe, my orange and espresso soap recipe uses a combination of ingredients that create a rich and creamy lather with the allure of coffee. And like Beth’s homemade pumpkin pie soap recipe, I’ve also included coconut milk in my soap recipe in addition to giving it an aesthetically rustic look. 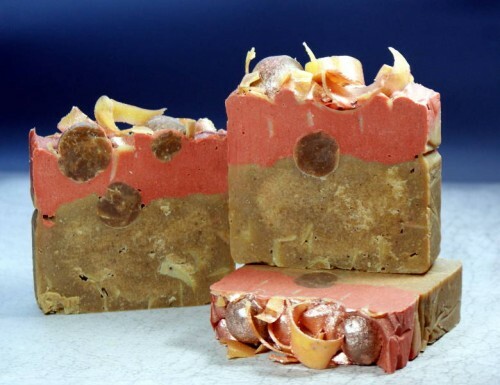 This texturally interesting and skin conditioning soap then combines the luscious seasonal scents of orange and espresso for a homemade soap that smells like rich chocolate and a hint of orange similar to those delicious Terry’s chocolate oranges you can buy during the Christmas season. Keep reading to learn how to reproduce my homemade orange and espresso soap recipe for upcoming holiday gifts or simply for you and your family to enjoy. The pumpkin seed oil was not calculated with the other oils in the lye calculator. However, you can add the pumpkin seed oil to your other soapmaking oils when they are being heated. It doesn’t matter if it’s added at the beginning or at trace. In addition I also used soap curls as decorative elements in this homemade orange and espresso soap recipe. I made the soap curls using a potato peeler and a bar of my natural blueberry and carrot cold process soap. I included the soap curls both within the bottom layer of the soap, which I scented with the Espresso fragrance oil, and on top of the soap once it was poured. Unfortunately, the yellow curls in the bottom half of my soap didn’t “pop” the way I had hoped as they do in melt and pour soap. Although they do add some rustic “roughness” to the overall look. The circles in this soap were made from small hand rolled balls of my homemade coffee soap that I had made from the ends of this particular soap when it was first made. These decorative elements – the soap balls and soap curls – are of course optional. 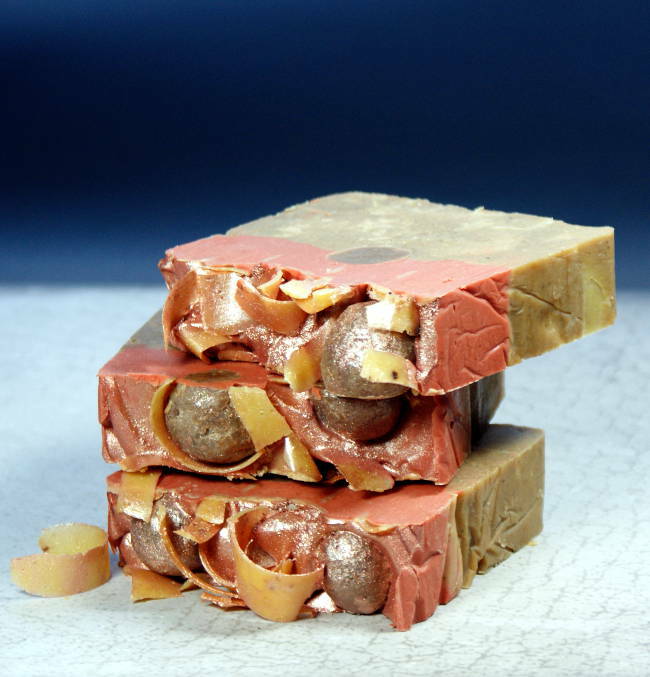 If you don’t wish to use palm oil and/or palm kernel flakes in this homemade orange and espresso soap recipe you can substitute the palm oil for lard (pig tallow) and the palm kernel flakes for coconut oil. However, you will need to run the resulting soap recipe back through a lye calculator. These changes will also change the properties of the final soap bars somewhat. As with most of my homemade soap recipes, my orange and espresso soap recipe will fit inside one of my DIY wooden loaf soap molds and will yield approximately 10-12 bars depending on how thick you cut them. To make this homemade orange and espresso soap recipe, you’ll need to follow my basic cold process soapmaking method instructions. (If you’ve never made cold process soap before here’s a good, inexpensive beginner’s cold process soap recipe.) Be sure to take all proper safety precautions when working with lye including goggles and gloves. Now weigh out the soapmaking oils using a digital scale and combine in a stainless steel pot. Heat until all the oils have melted, then remove from heat and set aside. When the lye-water and soapmaking oils have cooled to around 95°F you’re ready to make this homemade orange and espresso soap. Start by weighing out the coconut milk powder and adding it to the soapmaking oils. Next, measure out the benzoin powder – I used this to help the orange fragrance oil stick better – and also add this ingredient to your soapmaking oils. Combine the coconut milk powder and benzoin powder with the soapmaking oils by using a stick blender to mix them together. Mix until the soapmaking oils are free of clumps and the added ingredients have been evenly distributed. Now weigh out the liquid sodium lactate and stir it into the lye-water. Next, slowly pour the lye-water into the soapmaking oils. Mix with a stick blender until you reach a light trace. Divide the soap batter in half by pouring half into a large glass bowl, stainless steel pot or a two quart sized Pyrex measuring cup. Weigh out and add the Espresso fragrance oil to one half of the soap batter. Mix with your stick blender to combine. Once your soap reaches a medium trace pour it into your prepared mold. In my case, I poured the espresso soap scented layer into my lined mold that contained about 3/4th of a soap bar of soap curls. I then tapped the mold on the counter several times to remove any air bubbles, then added a row of soap balls down the entire center of the poured soap. Now weigh out and add the Orange Peel fragrance oil to the second half of your soap batter along with the mica and oxide pigment powders. Mix well with your stick blender until you achieve a medium trace then pour the soap into your mold on top of the espresso scented layer you previously poured. Once this was done I then added more soap balls and soap curls to the top of the soap loaf, then dusted the top of the soap with additional Earthen Mist mica. Finally, you’ll need to cover your soap for the saponification process. As I wanted to ensure the integrity of the soap curls on the top of my soap, I simply took a second wooden loaf soap mold and placed it upside down over top of the loaf mold with the soap I just poured. 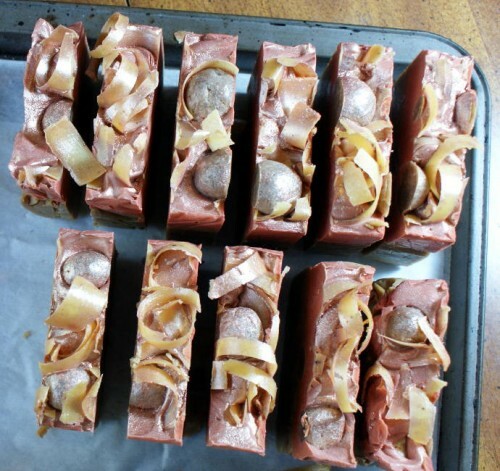 If your soap is hard enough the next day, you can unmold your homemade soap loaf and cut into bars. Otherwise, give it an extra day. I unmolded my orange and espresso soap loaf the next day but waited until the following day to cut the soap into individual bars. Allow bars to cure 4-6 weeks before use, then wrap and label as desired. Once your homemade orange and espresso soap has cured it’s ready for you and your family to use or to give as homemade gifts! 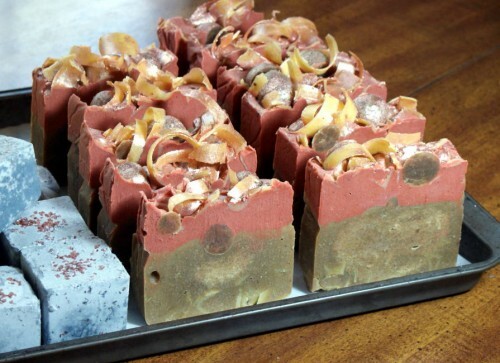 For more of my homemade soap recipes be sure to visit Rebecca’s Soap Delicatessen. You can also follow me on Pinterest for collections of not only my homemade soap recipes and other homemade gift ideas but also some of my favorites from around the web. Or keep up with all of my new homemade soap recipes and other DIY creations by following Soap Deli News blog via Blog Lovin’ and Tumblr. You can also find me on Facebook, Twitter, G+ and Instagram.